He keeps saying he'll have to show me but the opportune moment for that never comes around because he's never at the same location when I either put my tie on or take it off. After my last trip to Perth I decided I'd teach myself to tie a necktie correctly so next time I could impress my Dad. Of course I went straight to the internet to see what I was doing wrong. 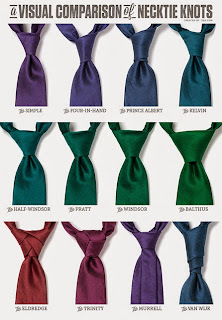 Turns out there are at least 12 different ways to tie a necktie (with more coming soon on ties.com at the time I'm writing this). How am I supposed to know which version is the one my Dad says is the correct way to tie a necktie now? From what I can tell, the one I figured out myself is the first one in the image on the right, called 'the simple'. So I haven't actually tied mine wrong at all, just different to how my Dad would tie his. I've never really looked closely at how my Dad ties his necktie but at a guess, I'd say he probably uses the Windsor (third from the left second row in the image). I think the more perfect triangle is probably why he looks at my effort and tells me I'm tying mine wrong. Maybe the next time I see him I'll go for the Eldredge or Trinity knots (bottom two on the left in the image) because those two scream wanker to me. If you turn up with either of those two knots you're basically just showing off. Which is pretty much what I'd be doing so why not just go all the way with it! It's a wonder your Dad remembers how to tie a necktie, but I suppose it's like riding a bike, you don't forget. He did have to tie one at least every week in UK as he, and we when we got together used to go to a lot of Saturday night dances apart from the local one, but we went further afield then into the cities! All on public transport, ie: the bus in all weathers! I think he used to wear one for work too, even though he worked in a electrical warehouse, but had to go on the service desk too for short spells, so he would have had plenty of practise! Imagine tying a tie everyday - but you wouldn't think anything about it back in the 50s and 60s, as most men wore ties to work unless you were in a grimy job.